Shane Shirley : Tennessee coal ash disaster...Toxins in the USA...Uranium anyone? Tennessee coal ash disaster...Toxins in the USA...Uranium anyone? Evans' testimony seems almost eerily prescient now in the wake of the disaster that befell an Eastern Tennessee community this week following the collapse of a lagoon holding coal combustion waste from the Tennessee Valley Authority's Kingston power plant. 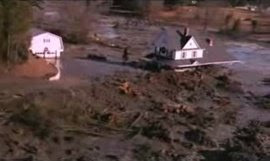 The resulting deluge inundated 12 nearby homes, buried more than half a square mile in four to six feet of hazardous waste, and blocked a tributary of the Tennessee River, which provides drinking water for millions of people downstream.TVA, a federally-owned independent corporation, initially estimated the amount of coal sludge released at 1.7 million cubic yards. But after completing an aerial survey of the inundated area, it revised its estimate upward to 5.4 million cubic yards. That's more than 1 billion gallons of waste containing potentially dangerous levels of heavy metals including arsenic, cadmium, mercury and lead, as well as radioactive elements such as uranium and thorium -- impurities typically found in coal. While the company is downplaying the hazardous nature of the material, telling the New York Times that it's "inert" and "not toxic or anything," an assessment by the Environmental Protection Agency found that the risk of getting cancer from coal ash lagoons is 10,000 times greater than safety standards allow.The Southern Alliance for Clean Energy is warning people to avoid bodily contact with the ash -- and calling on government authorities to provide the public with more information on the potential hazards. "There are multiple pathways in which people can become potentially affected by these heavy metals, including bodily contact, drinking water, air pathways and aquatic wildlife and fish," says SACE Executive Director Dr. Stephen A. Smith, "and we feel that appropriate warnings should be expressed to ensure the safety of Tennessee residents." Please click on the title above for the entire article and click on the links in bold above for more information. I just cannot believe that there are still lies being spewed when an environmental disaster occurs like this. Anyone with common sense knows that this is not good for our health and the health of our environment. Doesn't it just make you so mad that the government is expecting us to buy this crap (it's "inert" and "not toxic or anything..") they are espousing? "As the nation’s largest public power producer, TVA recognizes that the environmental consequences of its operations are far-reaching. By continually working to improve its environmental performance and taking a leadership role in clean-energy development, TVA helps safeguard our natural resources for future generations." Let's hope that they will walk the walk and do everything proactively and be completely honest about the environmental health and health of the local populations...which could be far reaching. So far I haven't seen a TVA demonstrate the understanding that the detrimental environmental consequences of their operations are far-reaching.